The much hyped and much opposed investigation of the state of the life of women religious in the United States of America has concluded, and commentators are shocked - shocked! - to find it is a whitewash. While acknowledging the practical problems arising from an aging body of sisters (the average age is 75, and there are more sisters over 90 than under 60), they are congratulated for their witness and good works. They are heading down the pan, and the people writing this report aren't terribly interested in working out why, either to make suggestions for reform or as a warning to others. The fact that many of the sisters have completely abandoned community life, neither praying nor living together; the fact that many of them have adopted work which has no specific relation to their community's charism nor indeed to the Catholic Church; the fact that many have discarded any semblance of religious dress and any semblance of the Office; the fact that many of them have lost the Faith: these facts would explain it. We don't really need a report from the Vatican to tell us, it is all in Ann Carey, 'Sisters in Crisis', now in a second edition. This was in the glorious reign of St John Paul II. If we look beyond religious sisters, there are more examples. To stick to America, the seminaries were investigated by a Vatican-mandated commission, led by Bishop John Marshall (the 'Marshall Committee'), starting in 1981. The report may have had some useful things to say, but it was never made public. The final report, delivered in 1988, could be presented by the American bishops as drawing attention to no serious problems requiring serious reform. It's all there in Michael Rose's 'Goodbye Good Men'. This was, remember, the worst decade for American seminaries, the absolute nadir from academic, disciplinary, and liturgical perspectives, a period which today evinces a rolling of the eyes even from liberal clergy. Over the years there have been innumerable visitations, investigations, reports, and the like, into seminaries, the religious life, and other aspects of the Church's life, in different parts of the world, and no matter how dreadful the situation, how rapid the collapse, these official probes never seem to lead to officially enforced changes which would actually make a positive difference. In the post-conciliar era, this does not seem to be the way things are done. Things have improved. Really bad practice leads to self-destruction, and in this way, over the long term, weeds itself out. Institutions which resist really bad practice grow and, slowly, become more prominent in the life of the Church. A generation fired up by the fashionable rubbish of 1960s has given way to a generation fired up, if that is the right phrase, by a sober re-assessment of that rubbish, and the latter generation is beginning to reach the level of the episcopate. But the generational shift, in scholarship and in the leadership of the Church, has very little to do with commissions from Rome demanding that standards be maintained or abuses be ended. No one should put any trust in official commissions. The human pressures against rocking the boat are just too great: even if the boat is sinking. A more gradual pressure, exercised by Vatican departments over many years, making use of information provided by various sources, can and in particular cases has had a beneficial effect. But the renewal we are beginning to experience is ultimately down to the Holy Spirit, despite human obstacles, not anyone in Rome laying down the law. Through the grill, visible on the left, is a young community of contemplative nuns. What can we do? Something positive for the liturgy, for catechesis, for Catholic education, for vocations, at the local level, as many others are doing, gradually overcoming the resistance of the liberal gerontocracy. The best way, of course, is to join the Latin Mass Society. But then I would say that! "The final report, delivered in 1988, could be presented by the American bishops as drawing attention to no serious problems requiring serious reform." 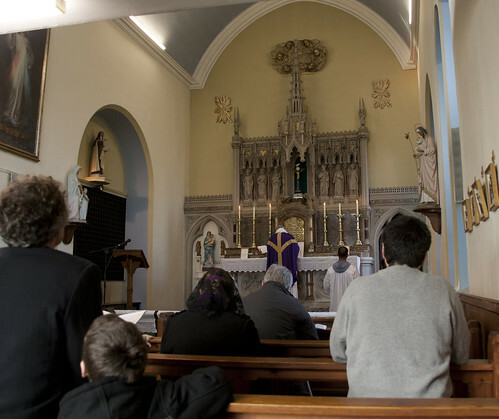 ive just joined the latin mass society-so count me in amongst the true defenders of the one true faith of our lord jesus christ!i also attend the sspx mass when i can.your assessment of the rampant liberal heretics as old and dying off is so true! !God Bless all in the latin mass society and the sspx.by the way i am 62 yrs of age and have lived through the outrages of the stalinist purges of vatican 11! !Philip Johnson.